Media interest in autonomous cars fell by 25% in 2018. Ocado’s investment in A.I. proves to be a PR success, with an eightfold increase in news coverage. Autonomous vehicles, robotics, and predictive analytics are the hottest areas for innovation in transport and logistics. Transport and logistics is all about getting things from A to B. As straightforward as this sounds, thousands of factors come into play. From roadworks to fuel costs, from leaves on the line to Brexit – it gets complicated, fast. These problems must be overcome by the smartest people. Or the smartest algorithms. Stepping on the gas, the transport and logistics industry is implementing a range of different A.I. tools to scale-up operations, cut costs, and improve efficiency. We used Signal, our A.I. media monitoring platform, to find out what the three biggest A.I. technologies are in the transport and logistics sector. 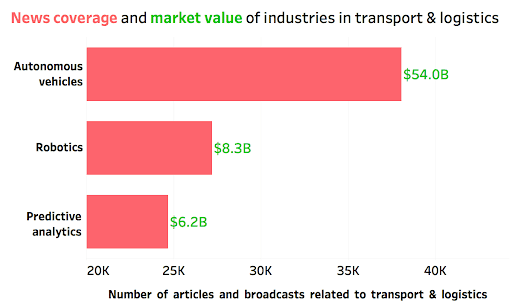 We also compared news coverage to how much each industry is worth. 1.Autonomous vehicles: self-driving cars slow down – 38,071 media mentions in 2018, currently a $54 billion industry. Driverless cars were a hot topic in the media last year, and rightfully so. For those of us who hate making awkward chit-chat with Uber drivers, this was exciting news. But self-driving cars are so last year. Media coverage of this craze fell by 25% over the course of 2018, as news outlets gradually lost interest. As it turns out, 2019 is the year ship happens. Media coverage of autonomous ships within the transport and logistics industry rose by 56% between Q1 and Q4, with a particular focus on Rolls-Royce. The automobile giant is making the move from sedans to ships, working with Intel to create fully autonomous naval vessels. The cutting-edge tech can detect and classify objects in the water, monitor engine performance, and pick the quickest routes. This means a greater amount of freight can be transported in a shorter amount of time. Additionally, 80% of all accidents on sea occur due to human error, making autonomous ships a much safer option. Following the media coverage Rolls-Royce received for their innovation, more companies will follow suit and invest in this technology. The autonomous ship market is expected to rise by $7.7 billion over the next decade, and there is no doubt that whoever invests in this emerging industry will gain an edge in maritime trade. 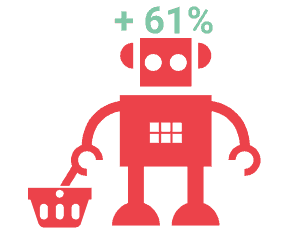 2.Robotics: better, faster, stronger – 27,204 media mentions in 2018, currently a $8.3 billion industry. As demand rapidly increases, companies are having to find innovative new ways to supply enough of their products in a short amount of time. Despite factories and warehouses traditionally being staffed by humans, our limbs and brains can only work so fast. Companies are now using A.I.-powered robots to perform the most time and energy consuming tasks. Robotics in the transport and logistics industry are popular in the news, with media coverage increasing by 61% over the course of 2018. British supermarket Ocado, for example, is using robots to pack items for online orders. Their technology can pack up to 50 items in a few minutes, which is far quicker than even the most skilled human. When Ocado revealed their incredible technology to the public, news coverage increased eightfold. Their A.I. technology proved to be both a logistical and PR success. The number of companies implementing A.I.-powered automated machinery in factories and warehouses is increasing, with global sales of logistics robots expected to rise by $22.4 billion in 2022. This will no doubt result in increased news coverage about robotics in the logistics industry, as more and more companies begin to automate labour-intensive processes. 3.Predictive analytics: no longer a guessing game – 24,685 media mentions in 2018, currently a $6.2 billion industry. A.I. has completely transformed predictive analytics. Companies can determine future demand, and accordingly alter stock or decide on the minimum number of vehicles needed for transportation. This in turn cuts costs and reduces emissions. Excited by this, more businesses are investing in predictive analytics, with the market expected to reach $10.95 billion by 2022. Last year, LiteLink Technologies released their 1SHIFT Logistics platform, an end-to-end logistics solution that incorporates A.I. The same month LiteLink Technologies released their platform, their media coverage shot up by 900%. Nobody loves a product release more than transport and logistics professionals. Especially if it’s a product that’ll make life a lot easier. When predictive analysis is powered by A.I., decision making becomes so much simpler. And there’s nothing more convenient than putting your feet up and letting an ultra-smart piece of technology run your business for you. Autonomous vehicles consistently attracted the most media coverage. Robotics and predictive analytics both received very similar amounts of coverage, although the year ended with robotics gaining more traction. This was due to an increased number of companies investing in warehouse automation in the final quarter of 2018. Want to know more about how the media is responding to changes in transport and logistics? Drop me a line and let’s chat.